Did you know you can find repair shops all over the Portland region through an online database? Portland Repair Finder is dedicated to helping more people fix more things. The organization makes tools, knowledge and resources easier to find, and helps tell the stories behind repair work. They believe that repairing things is good for the local economy, community and environment, and it is empowering and fun. The creator of this online tool is Joel Newman. He started the website in 2017 to become a comprehensive access point for repair of all kinds around Portland. His background is in art and design - and bicycle repair. Joel (right) fixing a bike at a Repair Cafe. He said over the next year they will be revising the search and filtering features, as well as growing the database of repair shops and resources. The ability to search the site by item as well as by mode of repair– whether that's a needed tool for a DIY fix, expert advice or professional repair– is key to showing people the range of options available, and getting more people involved. With the holidays upon us, now’s a good time to find alternative gift ideas. Look at who you plan to buy for this year. Would they benefit from a gift certificate from a jeweler, cobbler or for a gadget? Could a family heirloom be repaired, old photos be restored or a favorite outfit brought back to life through alteration? There are 200 businesses included on the Repair Finder. And don’t forget about free repair events in the region. Both Repair Cafés and Repair Fairs take place around the Portland region throughout the year. Think of these events as an ongoing way to get small repairs made to keep your possessions in circulation and in use. The Resourceful PDX event calendar lists all the repair events taking place, along with other community events. The holidays provide moments for meaningful gift ideas that show love and appreciation for those in your life - and ways to create more memories instead of more stuff. Alicia Polacok from Resourceful PDX partner, Bureau of Planning and Sustainability, shared examples from this Top 10 Waste-Free Gifts on the KATU Afternoon Live TV show. She also told viewers about the Portland Winter Curbsider, in mailboxes now and full of more good ideas and holiday related information. Need even more ideas? The Center for a New American Dream has you covered. Check out the many ways to Simplify the Holidays with the More Fun Less Stuff Catalog and this year’s calendar to get six weeks of daily inspirations and practical tips for simplifying your holiday season. December is the season of creative giving and good times spent with friends and family. Remember, Portland is full of community resources —and resourceful ways — to give and make meaningful moments. Give a fun outing to ZooLights for kiddos who already have a full toy box. Families with kids may like a membership to the zoo, OMSI, children’s museum, or tickets to a play, movie or a sports event. While gifts of experience can be a tough sell to little kids, you can help make it fun in the moment too. Help dad clean the gutters with an extension ladder borrowed from a tool library. Tool libraries are available to residents of East Portland, North Portland, Northeast Portland, and Southeast Portland. Become a member of a tool library near you! Gift a family member or neighbor time — yours! — to help with a house project. Repair a favorite old lamp for mom at a repair café. Repair PDX hosts monthly free repair events that bring volunteers who like to fix things together with people who have broken items that need fixing. Help spread repair culture through the repair movement! Find a gently used party dress! Portland has a thriving reuse and thrift shop market for not only clothing, but also household goods, electronics, furniture, art supplies and building materials. Check out the Resourceful PDX map for lending libraries, donation centers, resale, repair and swap shops. The map works on mobile, too! 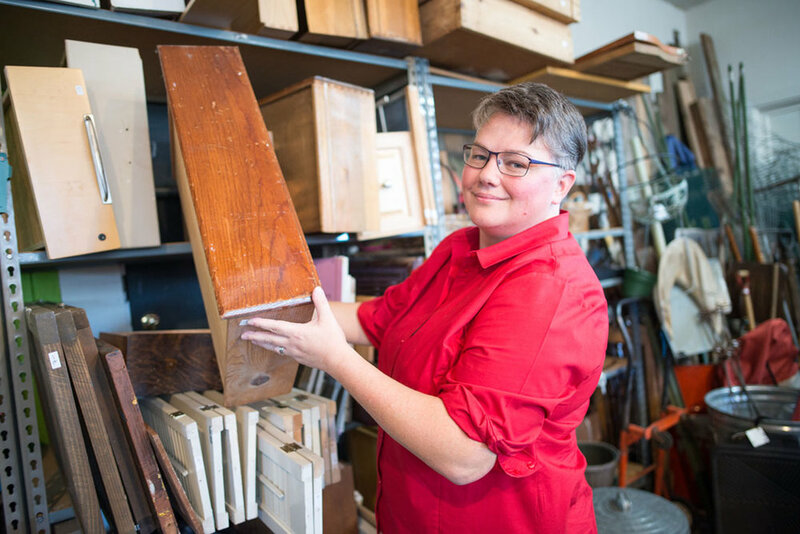 The new Resourceful PDX map includes community-based, not-for-profit or grassroots organizations that help residents reuse, swap, repair and share such items as tools, building or art supplies, household goods or other materials. 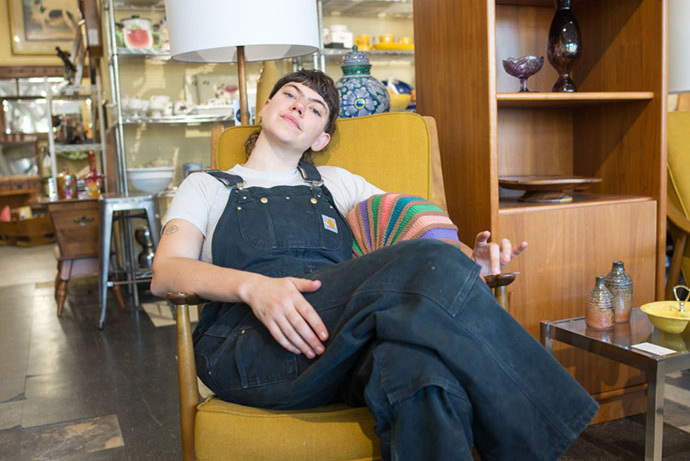 Lane’ Bigsby from Something Borrowed invited Alicia Polacok from Resourceful PDX partner, Bureau of Planning and Sustainability, to visit her vintage-inspired rental shop. In 2011, Lane’ Bigsby planned her own vintage-style wedding, showcasing her and her husband’s Do-It-Yourself (DIY) vision and commitment to sustainability. 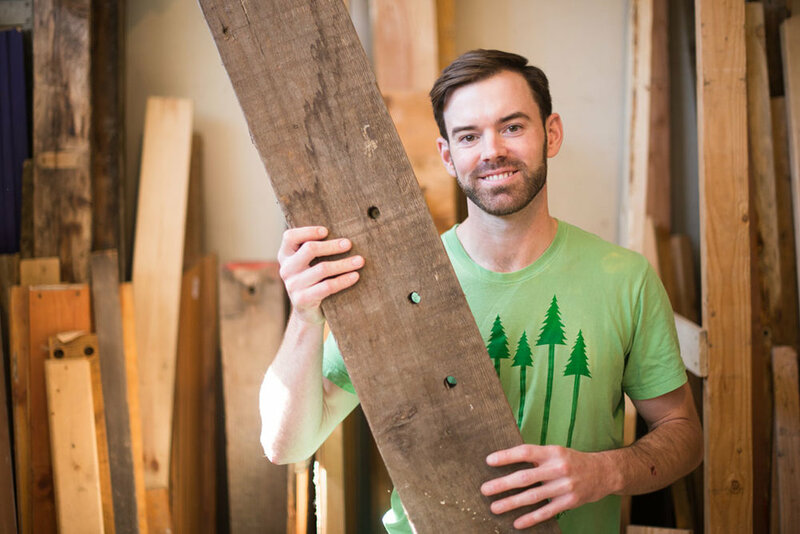 This process inspired Lane’ to start Something Borrowed to help others have the unique events they envision while reducing waste, too. DIY is at the heart of Lane’s rental business. 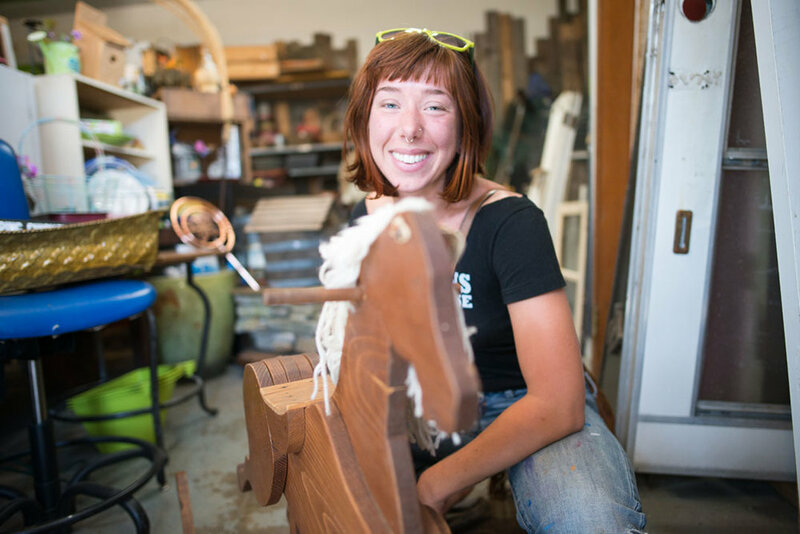 In addition to her re-styling experience, she has taken up upholstery and her husband now does woodworking. Lane’ often repurposes objects many times and in many different ways, getting the most value out of each object, adding creativity to the event, and saving costs for her clients. The inventory at Something Borrowed includes a plethora of items to rent for any kind of event – from weddings, birthdays and baby showers, to corporate events, trade shows and production photo shoots. Clients have even rented items for family holidays and a funeral. When considering new inventory, Lane’ carefully selects items that can be used many times, and have a big impact in saving waste. She shops from websites like Craigslist, Etsy and eBay, and from previous clients who offer Something Borrowed the chance to buy items from their one-time events. Lane’ says she enjoys helping clients learn new ways to be resourceful. Lane’ also incorporates what she calls a “hyper-local” attitude to her business. View vintage and modern finds on the Something Borrowed website and at the one-stop-shop warehouse and showroom by appointment in North Portland.